New Delhi: It’s been five years since Honda Motor Co. parted ways with the Hero Group.Since then, the Indian two-wheeler unit of Honda Motor Co. has doubled its market share in the world’s largest two-wheeler market. According to a Mint analysis, while Honda Motorcycles and Scooters India Pvt. Ltd has doubled its market share to 26% between 2010-11 and 2015-16, its erstwhile partner and market leader Hero MotoCorp Ltd has seen its market share slide 4.75 percentage points to 38.95%—the lowest in over two decades. Pune-based motorcycle maker Bajaj Auto Ltd’s share of the market has nearly halved to 11.49%, according to data provided by industry lobby Society of Indian Automobile Manufacturers (Siam). Bajaj does not sell scooters. Chennai-based TVS Motor Co. saw its market share slip three percentage points to 11.83% in 2013-14 but it has since recovered some ground—to 13.4% in 2015-16—to emerge as the country’s third-largest two-wheeler maker after Hero and Honda. The Indian two-wheeler market has grown from 11.79 million units a year to 18 million in the same period. According to the government’s Auto Mission Plan II, released in September 2015, India’s two-wheeler market is expected to expand to 55 million units a year by 2026. It was on 22 March 2011 that Honda sold its stake in Hero Honda Motors Ltd, bringing to an end to a 26-year partnership, which proved to be one of the most successful among a bunch of similar collaborations between Indian and Japanese automobile firms in early 1980s. Incidentally, HMSI started operations in 1999—over a decade before Honda Motor’s partnership with Hero ended. According to Abdul Majeed, partner and national auto practice leader at Pricewaterhouse Coopers, the split between Hero and Honda has been beneficial to both parties. “I think both parties have built on factors that led to their split," Majeed said. “Hero, in fact, now thinks like a global player." To Hero’s credit, the firm has managed to silence sceptics by building a world-class, 250-acre research and development (R&D) centre in Jaipur, a long way from the sub-10 acre area dedicated to R&D at the company’s Dharuhera plant in Haryana. Hero has forged partnerships and joint ventures with leading global tech providers—Magneti Marelli, AVL List GmbH and Engines Engineering, to name a few. The company has ventured into at least 30 overseas markets. Even so, some analysts say the real challenge for India’s largest maker of motorcycles only starts now as the company prepares to introduce the first motorcycle built entirely by Hero engineers. Currently Hero continues to market products which, over the years, have undergone only minor tweaks. In a 26 March interview, Hero chairman, chief executive and managing director Pawan Munjal said that he is “not unduly concerned by temporary fluctuations in market share here and there…that keeps happening all the time", and added that his company continues to aspire to an “overall share of 50% in the market". According to Jay Kale, an analyst with Mumbai-based brokerage Elara Capital, while Hero’s brands continue to dominate the domestic market, its new R&D facility is expected to plug the technology gap, which has long been the “chink" in the company’s armour. In 2-4 years, Hero’s R&D centre is expected to develop new 100-110cc motorcycle brands, new scooter brands and build bigger capacity bikes inspired by the success of Bullet maker Royal Enfield, analysts Basudeb Banerjee and Jigar Shah of Antique Stock Broking Ltd wrote in an 11 March note to investors. Honda’s growth, on the other hand, has been fuelled by urban India’s penchant for scooters, which are easier to manoeuvre, making them hugely popular with women. Between 2010-11 and 2015-16, sales of Honda’s scooters have grown at an average of 35% every year even as it failed to make an impact in the motorcycle segment. Sales of Honda’s motorcycles slowed to 6.4% in 2014-15 and have declined 14.48% in the 11 months of the current fiscal. This may also mean that Honda may register its first decline in market share in the past five years. This fiscal, it controls 26.14% of the market. The company faces stiff resistance in rural areas due to its late entry to the mass motorcycle segment—between 100cc and 110cc—which accounts for 40% of total two-wheelers sold. However, it hopes make inroads with network expansion and efforts to build trust among buyers. “We have around 14% share in motorcycles and we have a long way to go," Y.S. Guleria, senior vice-president (sales and marketing) at Honda Motorcycles and Scooters India. “By virtue of our late entry to the (mass) segment in 2012, it will require long-term, consistent efforts from us as the category is very conservative," he added. Even in the scooter segment, the biggest threat to it is Hero, which has introduced two new scooter brands, Duet and Maestro Edge. 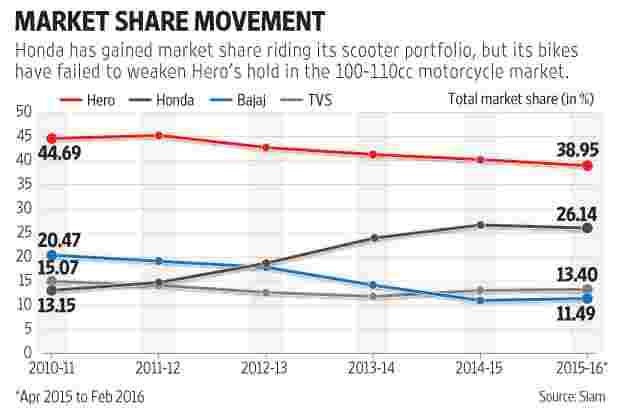 In the five months to February, Hero has increased its market share in scooters from 13% to 21%, while Honda banks on Activa to drive scooter sales. Guleria clarified there is no decline in demand for Honda’s scooters; on the contrary, the company has been affected due to its inability to meet demand owing to capacity constraints. “It has nothing to do with the market slowdown but capacity constraints at our end," he said, adding, “We still have 35,000 customers waiting for Honda scooters. Till March, you will not see much growth of Honda but we will pick up from April." Majeed believes that it won’t be easy to shake Honda’s stranglehold on scooters. “Nobody really believed that scooters have growth potential. They (Honda) brought products that met expectations and revived the segment completely," he added. Honda has begun ramping up its infrastructure. From one manufacturing facility with a capacity to make 1.6 million two-wheelers in 2010-11, the company now has four factories where it can produce 5.8 million vehicles a year. Hero, on its part, has the capacity to produce 8.1 million units a year. Even on the sales and service front, against Hero’s 6,500 outlets, Honda has 4,600—up from 1,150 five years ago. “One thing that has favoured Honda is that we managed to read the trend of customers’ preference for automatic scooters. This was by virtue of being segment leader," said Guleria. “We’ve to continue noting such trends in order to strengthen our position in the market."